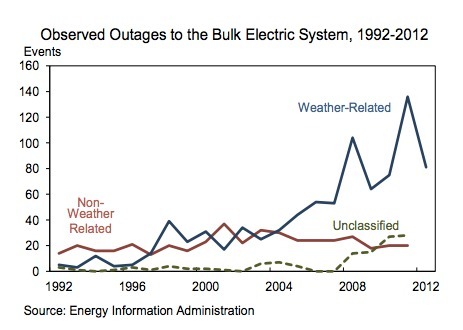 The U.S. electric grid is getting finicky in its old age. Add to that an increased probability of severe weather tied to global warming, and we're going to need to invest more than we currently are to keep it running. This is according to a report released today by the Obama administration that says more spending will, in the long run, save "billions of dollars and reduce the hardship experienced by millions of Americans when extreme weather strikes." Power outages cost the economy $18 billion to $33 billion per year, according to the report, a figure that has been rising steadily over the past 20 years. That can rise to $40 billion to $75 billion in years with severe storms such as 2008's Hurricane Ike and last year's Superstorm Sandy. The administration proposes spending on training and preparation, stronger equipment such as concrete poles, and more advanced sensing and diagnostic equipment that can predict failures, prevent them from getting worse, and restore power faster after it has gone out. According to the AP, however, "the report does not suggest how much new spending was needed" or "where that spending would come from." Per one expert's estimate, "a modern, efficient grid would cost $21 billion per year for 20 years." At the same time, he calculates, "savings resulting from a better grid would amount to $79 billion to $94 billion per year." At the very least, when the next superstorm rolls around, it'll be nice to be able to keep the lights on.